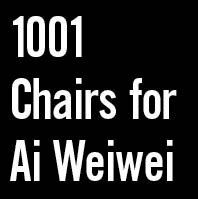 A couple of days ago I got a Facebook invite to participate in the 1001 Chair protest for Ai Weiwei on Sunday 4/17/2011 at 1 p.m. in front of the Chinese Consulate. It was reposted on several Facebook pages, including the Menil Collection's wall by one of its friends. I know of Weiwei and appreciate both his art and politics. I read about Weiwei's detention in the New York Times, which reported that he was accused of unspecified "economic crimes" such as tax evasion. I also know where the Chinese Consulate is in Houston because I always see protesters outside of it when I go to either Berryhill or Soundwaves on Montrose. I figured that the knowledge of these two facts constituted something like fate or an obligation on my part. So, I decided to attend. I expected to see a large, diverse crowd. After all, how often do the interest of a conceptual-political artist and corporate America coincide? Guilty or not just the fact that he's accused of "economic crimes" against the state has got to get the Fortune 500 jazzed. I expected all those social-media savvy C-Levels from the likes of ExxonMobil, Valero, GE, Carnival Cruiselines, Connoco Phillips, AT&T, Goldman-Sachs, Amazon and others (all of whom have managed some form of tax avoidance in the past 5 years) would have been a-twittering to their rank and file to champion Weiwei's cause. In fact, I'd expect all of corporate America to make him a "Cause célèbre" because as Nancy Folbre documents in her article Tax Havens and Treasure Hunts, it's all the rage. I convinced Sophie, my partner in crime and art, to come along. Of course I was late picking her up and empty handed. "Shouldn't have a sign or a picture or something?" she asked as she got into the car. "No," I assured her. "They'll be plenty of people with signs. We can borrow one." We arrived at 1:05 p.m. Looking for the huge crowd, I almost drove past the place. Only one woman was sitting on the steps. "They're probably around the side," I assured Sophie. We circled the block. No outraged artists. No corporate cronies. Nada. I'm ashamed to admit it, but I'm more of a mob-vigilante protester. I like numbers...lots of numbers. So, I drove to Dirk's coffee and ordered a frappuccino (to stimulate my courage), waiting for the masses to appear. As the barista frapped my frap, I had a revelation. May be this was a post-modern protest in which by sending out lots of FB invitations and liking pages about the protest, people were "protesting". Yet by not physically participating in the protest, they were also protesting the concept of the "Protest." They were challenging everything about the protest from the act of protesting as a concession to the oppressor (why the hell don't we just go get what we want) to the co-opting of the act of protesting by the Establishment as in astroturfing. After all, I didn't read the whole FB invite. When I returned, the protest still consisted of a lone woman. Sophie and I looked at each other. I started to mention my post-modern theory but then thought WTF. We parked, grabbed our chairs and our coffees, and joined her. She turned out to be the artist Catherine Lee, who'd driven in from the Austin area. We set up our chairs and chatted. Catherine didn't have a sign either so people just looked at us. Before we arrived, one pedestrian had asked her if she were "OK". A couple strode by and we informed them that we were protesting in support of Weiwei. They hadn't asked and didn't seem to care. They seemed to have more spring-like things in mind. 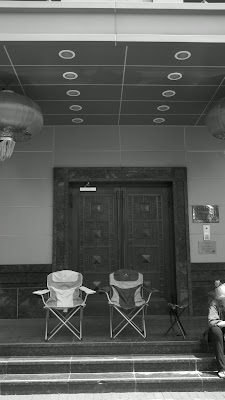 The three of us sat for about an hour, talked, wrote notes to the Chinese Consulate, and then left. According to the Guardian, in terms of numbers we gave Sao Paulo a run for it's money. We didn't come close to Hong Kong or Berlin or London or New York. But we did represent.